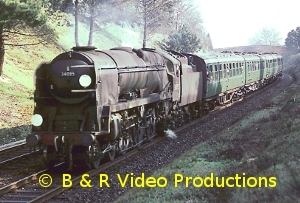 The fourth in our series of archive films showing the general scenes of the Southern Region in the 1960s with both service trains and enthusiast rail tours. We start with a visit to Portsmouth in 1960 before travelling along the coast towards Havant and a detailed look at the Terrier tank engines on the Hayling Island branch. Onwards to Brighton for scenes in 1960 plus a visit by ex-LNER No.3442 “The Great Marquess” in 1967. 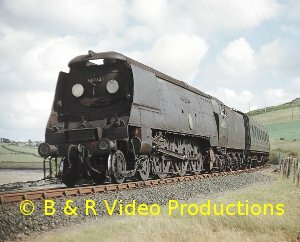 At the former Pullman Works, we see the stored locomotives belonging to National Collection before the site closed and they were sent to other locations.The Bluebell Line is featured during the early days of preservation in the 1960s, including visits of Caledonian Single No.123 and ex-LSWR T9 No.102 and footage of other early locos on the line. A visit to Tunbridge Wells West for Standard and H Class tank locomotives. South again to Southampton Docks in 1962 and the activities of USA 0-6-0 tanks and E Class 0-6-0s. A variety of engine types can be seen at Eastleigh shed. Around Southampton and into the New Forest, there is extensive coverage of the many different locomotive types to be seen during last days of steam on the Southern, including Bulleid Pacifics, Standards and even some ex-GWR and ex-LMS locomotives on inter-regional workings. Cover photo: Keith Pirt/Courtesy Booklaw Publications, Terrier Class A1X 0-6-0T No.32678 on Hayling Island, July1960. 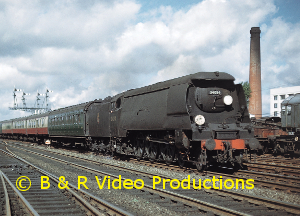 The third in our series of archive films showing the general scenes of the Southern Region in the 1960s with both service trains and enthusiast rail tours. 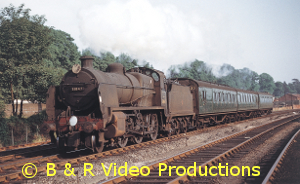 This volume was filmed between 1959 and 1967 and covers railway locations from BASINGSTOKE to MICHELDEVER, EASTLEIGH, FAREHAM, GOSPORT, PORTSMOUTH and the ISLE-OF-WIGHT. Many Southern classes are seen including Lord Nelson 4-6-0s, ex-LSWR T9s, Bulleid Pacifics, USA, L1, M7, E1 and B4 tanks, Q1, N class Moguls and BR Standards. Early preservation scenes of 34023 contrast with previous BR service views. There are even brief scenes of ex-GWR and ex-LMS locos on inter-regional trains. We visit the Mid-Hants railway at Ropley in pre-preservation times with 31768 4-4-0 on a railtour. At Eastleigh there are many scenes dating back as far as 1959 including views inside the Locomotive Works erecting shop. We visit the shed to see the many classes of engines present including LSWR T9 No.120. Eastleigh was the junction for Fareham and Portsmouth and we visit Droxford and Gosport on railtours before arriving at Portsmouth Harbour. 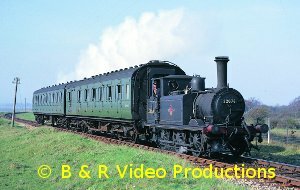 Finally we visit the ISLE-OF-WIGHT for extensive coverage of the last O2 tanks on the Southern at work on the Ryde, Newport, Cowes and Ventnor lines, including the last day of steam. Apart from a few scenes, all the material is in colour and the film has an extensively researched commentary with an authentic sound track. Cover photo:- Keith Pirt/Courtesy Booklaw Publications, 30859 “Lord Hood” at Battledown Flyover, April 1960.